Ablantis Dental > Treatments > What Are the Best Treatments for Sleep Apnea? What Are the Best Treatments for Sleep Apnea? It’s a known fact that that there is an estimated 22-million Americans who suffer from sleep apnea, with 80 percent of cases of moderate and severe obstructive sleep apnea undiagnosed. Here in San Diego and across the United States, the health issue is taking a major toll. Estimates suggest up to a quarter of adults between ages 30 and 70 are affected by sleep apnea, which causes intermittent pauses in breathing that disrupt sleep and decrease sleep quality. Even more concerning is that people with untreated sleep apnea are twice as likely to get hurt at work compared to those without the condition, according to a recent study conducted by a number of major universities. What’s more, sleep apnea sufferers are three times more likely to suffer injuries that were potentially fatigue-related. 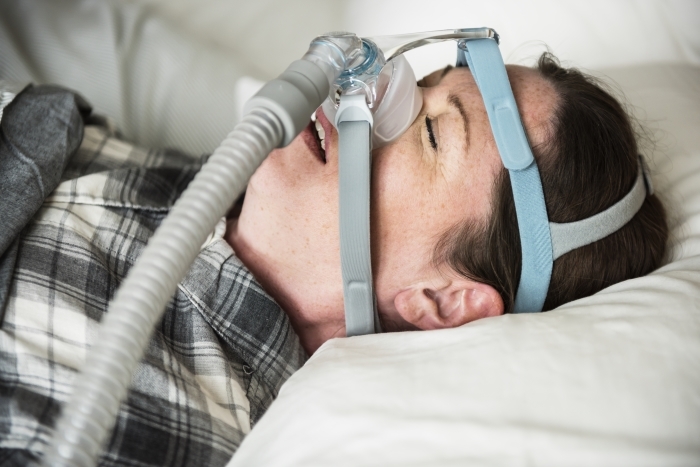 When left untreated, sleep apnea can lead to high blood pressure, chronic heart failure, atrial fibrillation, stroke, and other cardiovascular problems; it is associated with type 2 diabetes and depression; and is a factor in many traffic accidents and accidents with heavy machinery, owing to the persistent drowsiness suffered by many patients before the disease is recognized and treated. There are two types of sleep apnea: central sleep apnea (CSA) and obstructive sleep apnea (OSA), and both are very concerning. CSA involves breathing trouble to a weak effort from the lungs, and OSA identifies limited airflow due to the airways being physically blocked. OSA is the most common form of sleep apnea. How can the dentist help treat sleep apnea? The good news is that there are solutions available to treat sleep apnea, thanks to new technology. Meet oral appliance therapy (OAT). This treatment uses a state-of-the-art dental appliance to reposition one’s jaw allowing for better air flow. Then there is continuous positive airway pressure (CPAP) machines, which forces airways to open and restores air flow with a small motor attached to a hose that runs to a facemask and sends air up the user’s nose. For more serious cases surgery might be needed. Here are the symptoms you need to know about: trouble sleeping, snoring, lack of energy throughout the day, slow reflexes, mood swings, chronic headaches, elevated blood pressure, and increases risk of heart disease and stroke. Sleep apnea is a serious issue and addressing it now rather than later is very important for your health. If you think you suffer from sleep apnea, then contact Dr. Claudia Cortadi. She will provide solutions and most of all help get your life and health back in order. Call her today: 760.334.0128.